Porcine reproductive and respiratory syndrome virus (PRRSV) is an arterivirus that shows a restricted in vivo tropism for subsets of porcine macrophages, with alveolar macrophages being major target cells. The virus is associated with respiratory problems in pigs of all ages and is commonly isolated on farms with porcine respiratory disease complex (PRDC). Due to virus-induced macrophage death early in infection, PRRSV hampers the innate defence against pathogens in the lungs. In addition, the virus might also directly affect the antimicrobial functions of macrophages. This study examined whether interaction of European genotype PRRSV with primary alveolar macrophages (PAM) affects their phagocytic capacity. Inoculation of macrophages with both subtype I PRRSV (LV) and subtype III PRRSV (Lena) showed that the virus inhibits PAM phagocytosis. Similar results were obtained using inactivated PRRSV (LV), showing that initial interaction of the virion with the cell is sufficient to reduce phagocytosis, and that no productive infection is required. When macrophages were incubated with sialoadhesin- (Sn) or CD163-specific antibodies, two entry mediators of the virus, only Sn-specific antibodies downregulated the phagocytic capacity of PAM, indicating that interaction with Sn, but not CD163, mediates the inhibitory effect of PRRSV on phagocytosis. In conclusion, this study shows that European genotype PRRSV inhibits PAM phagocytosis in vitro, through the interaction with its internalization receptor Sn. If similar events occur in vivo, this interaction may be important in the development of PRDC, as often seen in the field. Porcine reproductive and respiratory syndrome virus (PRRSV) is the causative agent of porcine reproductive and respiratory syndrome (PRRS), which has become one of the most important diseases affecting swine industry worldwide. PRRS is characterized by reproductive failure in sows and gilts and respiratory problems in pigs of all ages [1, 2]. The annual cost of this disease is estimated at 664 million dollars in the USA alone , representing over one-third of the total losses in swine industry attributed to infectious diseases . PRRSV is a small, enveloped, positive-stranded RNA virus that belongs to the genus Arterivirus, which is classified within the family of the Arteriviridae, in the order Nidovirales. Two distantly related genotypes exist: the European genotype (type I) and the North American genotype (type II) [6, 7]. Within each genotype a high degree of genetic variability has been described [8, 9], which led to the recent proposal to subdivide the European genotype into different subtypes [10, 11]. Different PRRSV isolates also display a remarkable antigenic and pathogenic variability. Their virulence ranges from apathogenic or moderately virulent, to highly pathogenic, like the recently emerging type II isolates described in China  and the type I subtype III isolate PRRSV (Lena), originating from Belarus . PRRSV shows a restricted in vivo host tropism, infecting pigs only, as well as a restricted cell tropism for cells of the monocyte/macrophage lineage. The latter is reflected by the specific infection of subsets of macrophages that are mainly present in lungs, lymphoid tissues and placenta [14, 15], with alveolar macrophages being major target cells . The extensive PRRSV replication in the lungs results in lysis or apoptosis of infected cells and apoptosis of uninfected bystander cells [17–20]. In previous studies [21, 22], a decrease in the number of alveolar macrophages was found up to 9 days post infection, with a maximum decrease of 35–40%, followed by a marked increase up to 52 days post infection, resulting from replacement of these cells by infiltrating monocytes, which are known to differentiate into macrophages. Since alveolar macrophages are the predominant cells involved in the innate defence in the lungs , PRRSV infection impacts the respiratory immune system of the pig early in infection. The virus is associated with respiratory problems in pigs of all ages, is known to predispose pigs to secondary infections, and is commonly isolated on farms with porcine respiratory disease complex (PRDC) . PRRSV shows a tropism for specific subsets of differentiated macrophages , which is conferred by the presence of certain entry mediators. As reviewed by Van Breedam et al. , three entry mediators are known to be involved in the entry pathway of PRRSV in macrophages: 1) heparan sulphate glycosaminoglycans serve as PRRSV attachment factors involved in the initial binding and concentration of the virus on the macrophage surface; 2) the siglec sialoadhesin (Sn) interacts with sialic acids present on the virus, which leads to a more stable binding, and results in internalization of the virus together with its receptor; 3) scavenger receptor CD163 is implicated in virus uncoating and genome release. It is established that Sn functions as a clathrin-dependent endocytic receptor that can be targeted by Sn-specific immunotoxins to kill macrophages and by Sn-specific antigen immunoconjugates as a vaccination strategy improving antibody responses . Also, in a recent study it was shown that antibody binding to porcine Sn causes a decrease in phagocytic capacity of primary alveolar macrophages (PAM) . It was suggested that the interaction of other ligands with Sn might also result in an impaired phagocytic capacity of PAM. Considering the reported increase in secondary bacterial infections following PRRSV infection, the downregulating effect of antibody binding to Sn on macrophage phagocytosis and the fact that PRRSV interacts with Sn, we wondered whether PRRSV binding to Sn might likewise result in a decreased phagocytic capacity of PAM. Therefore, this study aimed to assess whether the interaction of European genotype PRRSV with PAM affects their phagocytic capacity, and whether interaction with its entry mediators Sn and/or CD163 mediates the inhibitory effect of PRRSV on PAM phagocytosis. PAM were obtained from 4- to 6-week-old conventional Belgian Landrace pigs from a PRRSV-negative herd as previously described . PAM and Marc-145 cells were cultivated as described by Van Gorp et al. .
Marc-145-grown virus: a 4th passage was used for the following PRRSV strains: 1) genotype I, subtype I prototype PRRSV strain, Lelystad virus (LV), that was first passaged on macrophages for 12 passages ; 2) genotype I, subtype III prototype PRRSV strain Lena, that was adapted on Marc-145 cells as described . For concentration and inactivation, a 5th passage of PRRSV (LV), that was first passaged on macrophages for 12 passages, was used. Macrophage-grown virus: a 13th passage of PRRSV (LV) and a 4th passage of PRRSV (Lena) was used. For concentration, a 14th passage of PRRSV (LV) and a 4th passage of PRRSV (Lena), were used. Virus titrations and calculations of the virus titres (TCID50 values) were performed as described before . For each experiment, virus titrations were performed on macrophages from the same batch as the batch used in the respective experiment. Virus was concentrated from the supernatant after filtration through a 0.45 μm filter (Sarstedt, Nümbrecht, Germany) as previously described . Virus inactivation through treatment with binary ethylenimine (BEI; Sigma-Aldrich, St. Louis, MO, USA) or with ultraviolet (UV) radiation was performed and verified as described before , always confirming complete inactivation. The IgG1 porcine Sn-specific mouse monoclonal antibody (mAb) 41D3 was used as a ligand to bind Sn [30, 31]. The IgG1 porcine CD163-specific mouse mAb 2A10 (AbD Serotec, Kidlington, UK; MCA2311) or a human CD163-specific goat polyclonal antibody (pAb) (R&D Systems, Minneapolis, MN, USA), which is known to cross-react with porcine Sn, were used as ligands to bind CD163 [28, 32, 33]. Isotype-matched irrelevant mAb 13D12, directed against pseudorabies virus glycoprotein gD , and purified goat antibodies were used as controls. MAb 41D3 and 13D12 were purified using protein G column chromatography (GE Healthcare, VWR, Leuven, Belgium) following the manufacturers’ instructions. PRRSV virions were visualized via the nucleocapsid protein-specific mAb 13E2 . To assess the effect of PRRSV or Sn- and CD163-specific antibodies on PAM phagocytosis, macrophages were inoculated with PRRSV or antibodies 24 h post seeding and further incubated for 1 h, after which a phagocytosis assay was performed. In a first experiment PAM were inoculated with macrophage- or Marc-145-grown virus at a multiplicity of infection (moi) of 0.3, 1, 3, or 5 for PRRSV (LV) or an moi of 0.3, 1, 3, 5, 10 or 30 for PRRSV (Lena). The moi was calculated as the ratio between the TCID50 value and the number of cells. As a control, PAM were mock-infected with macrophage- or Marc-145-supernatant of cells that were cultured for 5 days. In a second experiment PAM were inoculated with an moi of 0.1, 0.3, 1, 3, 10 or 30 of concentrated Marc-145-grown PRRSV (LV) or equal amounts of concentrated and inactivated Marc-145-grown PRRSV (LV). As a control, PAM were mock-infected with RPMI containing 10% PBS, which is the medium in which the concentrated virus is dissolved (and inactivated). As a control for the effect of the BEI-treatment of the virus on PAM phagocytosis, cells were mock-infected with BEI-treated RPMI containing 10% PBS, showing no effect on phagocytosis. In a third experiment PAM were inoculated with 0.15, 0.5, 1.5, 5, 15, 50 μg/mL mAb 41D3, 2A10 or 13D12 or the CD163-specific pAb. As a control, PAM were inoculated with PBS in the absence of mAbs. Also, for every experiment a phagocytosis assay was performed at 4°C, following mock-infection, to determine the number of beads bound to the cell surface. Phagocytosis assays using fluorescent beads were performed in suspension and were analyzed by flow cytometry following a propidium iodide (Molecular Probes, Eugene, OR, USA) live-dead staining as described before . Data were gated on FSC and SSC to remove debris from the analysis and on FL-2 to exclude non-viable cells from the analysis. The percentage of viable PAM phagocytosing beads and their MFI (median fluorescence intensity), which is a measure for the number of beads present per cell, was determined. Confocal microscopical pictures were generated as described before , including a staining for PRRSV particles using 13E2 as primary antibody, followed by goat-anti-mouse-FITC. Twenty-four hours post seeding, adherent cells were washed once with RPMI-1640 (Gibco, Invitrogen, Carlsbad, CA, USA) followed by inoculation with different PRRSV strains at an moi of 1. Inoculated cells were incubated for 1 h at 37°C in the presence of the virus. After virus removal, cells were washed 3 times to remove unbound virions and an immunofluorescence staining was performed as described before [29, 36]. Virus internalization in PAM was analyzed as previously described [29, 36], analyzing at least 20 cells per sample. For each experiment, PAM and virus from the same batch were used and each experiment was independently performed at least three times. Results are expressed as mean ± error of the mean (SEM). Statistical data analysis was performed using the GraphPad PRISM software package (v 5.0; La Jolla, CA, USA) using an unpaired t-test (analysis of the number of virions for macrophage- and Marc-145-grown PRRSV strains) or a paired t-test for all other analyses. P values < 0.05 were considered significant (* p < 0.05; ** p < 0.01; *** p < 0.001). To study whether European genotype PRRSV has an impact on phagocytosis by PAM, cells were inoculated with PRRSV (LV) and PRRSV (Lena) at various moi and further incubated at 37°C for 1 h, after which a phagocytosis assay was performed. Only viable macrophages were included in the flow cytometric analysis. Interaction of both PRRSV strains with PAM causes a reduction in phagocytosis by PAM (Figure 1A and 1B). For PRRSV (LV) this inhibition is observed, even though not statistically significant (p = 0.11 for macrophage-grown and p = 0.06 for Marc-145-grown PRRSV (LV) at an moi of 5). The analysis shows that both the percentage of macrophages phagocytosing beads (Figure 1A) and the number of beads phagocytosed per macrophage, expressed as MFI (Figure 1B), are downregulated. This observation is independent from the cell type on which the virus is grown, since both Marc-145- and macrophage-grown PRRSV strains are able to inhibit the phagocytic capacity of PAM. European genotype PRRSV downregulates PAM phagocytic capacity, depending on the number of internalized virions. Flow cytometric analysis of the effect of European genotype PRRSV entry on PAM phagocytosis and confocal microscopical analysis of the number of internalized PRRSV virions per PAM for Marc-145- and macrophage-grown PRRSV (LV) (Black circle) or PRRSV (Lena) (Grey circle): (A–B) The effect of both PRRSV strains on phagocytosis of beads by viable macrophages, expressed as the percentage of viable cells that have beads associated with them (A) or the MFI per viable cell (B), which is a measure for the amount of beads per cell. PAM were inoculated with both PRRSV strains at different moi as indicated and infection was allowed for 1 h, after which a phagocytosis assay was performed. Mock infected cells were included as a positive control. In addition, a phagocytosis assay was performed at 4°C (dotted line) after mock infection, to assess the percentage of macrophages that have beads bound to their surface and their MFI. Data represent the mean ± SEM of 3 independent experiments; (C) PAM were inoculated with both PRRSV strains (moi = 1) and further incubated for 1 h, after which the number of virions per PAM was determined by an immunofluorescence staining. At least 20 cells were analyzed per sample. Data represent the mean ± SEM of 1 representative experiment. *p < 0.05; **p < 0.01; ***p < 0.001. Since the European genotype PRRSV inoculums used in the previous experiment contain both infectious and non-infectious virions and since the multiplicity of infection, which was calculated as the ratio between the TCID50 value and the number of cells, does not take into account the absolute number of virions entering a cell, we wondered whether a difference in the number of internalized virions corresponds with a difference in inhibition of PAM phagocytosis. To investigate this, an internalization experiment was performed (Figure 1C). Internalized or surface bound virions were never observed after mock infection. 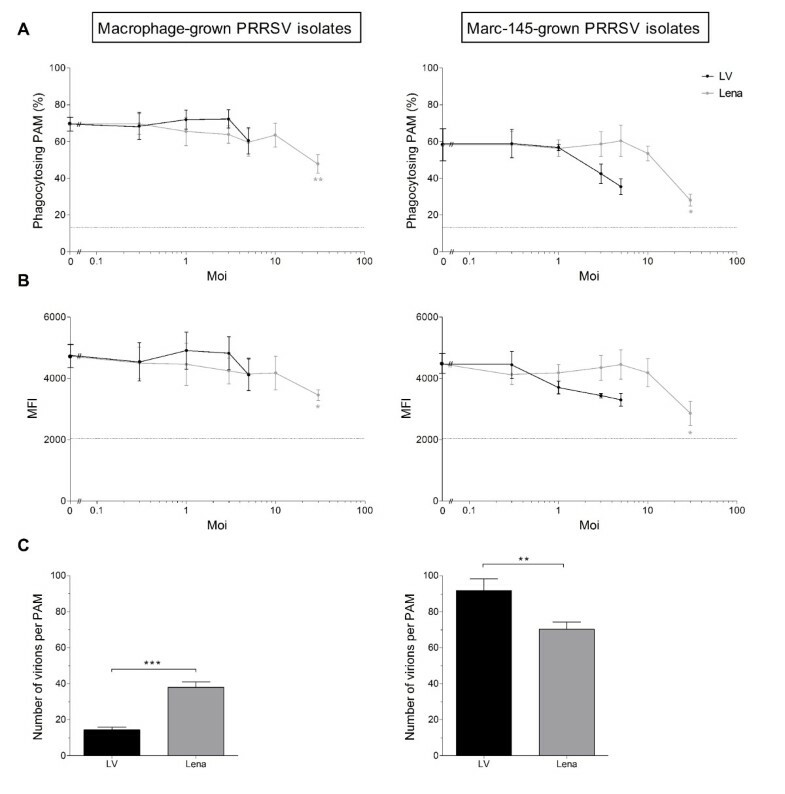 Interestingly, a higher number of bound and internalized virions corresponds with a higher reduction in phagocytosis for macrophage- and Marc-145-grown PRRSV (LV) and PRRSV (Lena) (Figure 1A and 1B). For macrophage-grown strains, PRRSV (LV) has a lower number of bound and internalized virions compared to PRRSV (Lena). This results in an inhibition of phagocytosis only starting from an moi of 5, whereas PRRSV (Lena) inhibits phagocytosis starting from an moi of 1. On the other hand, for Marc-145-grown strains, PRRSV (LV) has a higher number of bound and internalized virions compared to PRRSV (Lena) and inhibits phagocytosis starting from an moi of 3, compared to an moi of 10 for PRRSV (Lena). As a control, to assess whether administering higher numbers of virions leads to a higher reduction in phagocytosis, macrophage-grown PRRSV (LV) and PRRSV (Lena) were concentrated. PAM were inoculated with concentrated macrophage-grown PRRSV (LV) (moi = 10) or PRRSV (Lena) (moi = 100) and further incubated at 37°C for 1 h, after which a phagocytosis assay was performed. Indeed, phagocytosis of PAM infected with PRRSV (LV) (moi = 10) was further reduced down to 42%, compared to 68.3% for mock-infected PAM. Phagocytosis of PAM infected with PRRSV (Lena) (moi = 100) was reduced down to 9.4%, which equals the percentage observed when the assay was performed at 4°C (10%), when active intracellular uptake is blocked, yet passive surface adsorption of beads proceeds normally. Therefore, it can be speculated that phagocytosis of PAM is completely blocked when PAM are infected with an moi of 100 of macrophage-grown PRRSV (Lena). 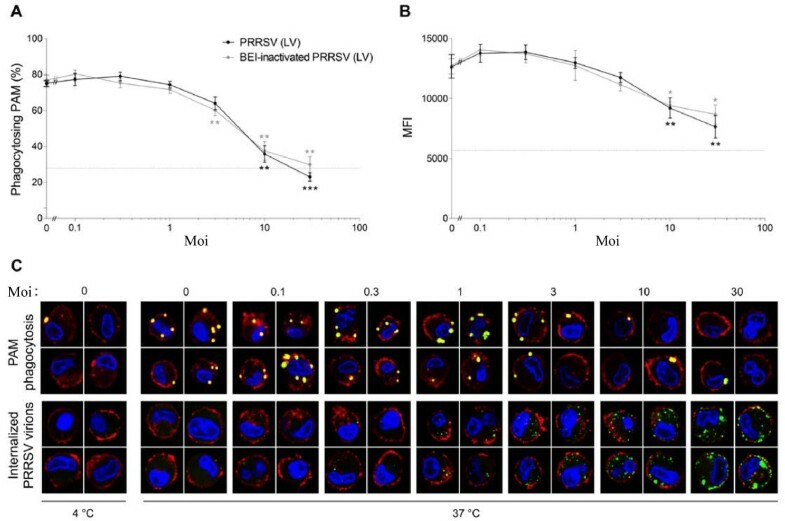 From these experiments we conclude that the effect of European genotype PRRSV on phagocytosis is determined by the total number of internalized virions. We suggest that both infectious and non-infectious virus contribute to the effect of European genotype PRRSV on phagocytosis, since at the same moi, the amount of internalized virions seems to determine the reduction in phagocytosis. Since the number of internalized virions appears to correlate with reduction in phagocytosis, it was investigated whether infectious PRRSV virions are needed for the inhibitory effect of European genotype PRRSV on PAM phagocytosis. Concentrated Marc-145-propagated PRRSV (LV) was BEI-inactivated, obtaining PRRSV virions that are able to bind and enter PAM similar to non-inactivated virions , without causing a productive infection. PAM were inoculated with either infectious or BEI-inactivated virus at different moi and further incubated at 37°C for 1 h, after which the effect on phagocytosis was studied (Figure 2). From our results, it is clear that BEI-inactivated PRRSV (LV) caused a similar reduction in phagocytosis as non-inactivated, infectious PRRSV (LV). In both cases, the percentage PAM phagocytosing beads (Figure 2A) and the number of beads phagocytosed per PAM (Figure 2B) was reduced starting from an moi of 3 and was further reduced when higher moi were administered. At an moi of 30, the percentage PAM phagocytosing beads was reduced down to the percentage observed when the assay was performed at 4°C (27.9 ± 0.6%), when active intracellular uptake is blocked, yet passive surface adsorption of beads proceeds normally. At this point, the number of beads per PAM was a little higher than at 4°C, as observed by MFI. This suggests that the phagocytic capacity of PAM is completely blocked at this point, even though more beads are bound at the cell surface. Similar results were obtained when UV-inactivated virus was used (data not shown). Hence, these findings show that the virus does not need to be infectious to cause a reduction in phagocytic capacity of PAM and it can therefore be assumed that binding and internalization of European genotype PRRSV virions into PAM is sufficient to reduce phagocytosis, without the need for viral replication. Figure 2c shows representative images which visualize that when a higher moi is administered, more viral particles have entered the cells and phagocytosis decreases. European genotype PRRSV does not need to be infectious to downregulate PAM phagocytic capacity. (A–B) Flow cytometric analysis of the role of PRRSV infectivity in the inhibitory effect of European genotype PRRSV on macrophage phagocytosis: The effect of Marc-145-grown infectious (Black circle) and BEI-inactivated (Grey circle) concentrated PRRSV (LV) on phagocytosis of beads by viable macrophages, expressed as the percentage of viable cells that have beads associated with them (A) or the MFI per viable cell (B), which is a measure for the amount of beads per cell. PAM were inoculated with infectious or inactivated PRRSV (LV) at different moi as indicated and further incubated at 37°C for 1 h, after which a phagocytosis assay was performed. Mock infected cells were included as a control. Also, a phagocytosis assay was performed at 4°C (dotted line) after mock infection, to assess the percentage of macrophages that have beads bound to their surface and their MFI. Data represent the mean ± SEM of 4 independent experiments. *p < 0.05; ** p < 0.01; *** p < 0.001; (C) Confocal microscopical representation of the inhibitory effect of European genotype PRRSV on macrophage phagocytosis: the effect of Marc-145-grown, concentrated PRRSV (LV) on phagocytosis of beads by viable macrophages (performed as described above). An immunofluorescence staining was performed following the phagocytosis assay. Mock infected cells were included as a control and a phagocytosis assay was performed at 4°C after mock infection. For each moi, 4 single confocal z-sections throughout the middle of the cell are given, representative of each situation. Yellow-green fluorescent beads were used, nuclei are stained with Hoechst 33342 (blue), PRRSV virions are shown in green and cortical actin is visualized using TexasRed-X phalloidin. Upper panel: PAM phagocytosis of beads; Lower panel: internalized PRRSV particles. Since inactivated virus also downregulates phagocytosis, the process causing this downregulation is not a replicative viral process, and probably results from a cellular process initiated upon interaction of the virus with the cell. Therefore we investigated whether the downregulation of phagocytosis could be explained by the interaction of the virus with its entry mediators Sn and/or CD163. To do so, another phagocytosis assay was performed. PAM were incubated with different concentrations of an Sn-specific mAb, a CD163-specific mAb or an isotype-matched control mAb for 1 h, after which the effect on phagocytosis was studied (Figure 3). Incubation of PAM with the Sn-specific mAb caused a downregulation of phagocytosis, starting from the lowest dose tested, affecting both the percentage of macrophages phagocytosing beads (Figure 3a) and the number of beads taken up per PAM (Figure 3b). PAM phagocytic capacity was further reduced when higher doses of the Sn-specific mAb were administered, up to 1.5 μg/mL, at which point phagocytosis was reduced down to the level observed when the assay was performed at 4°C, for both the percentage of PAM phagocytosing beads and the number of beads taken up per PAM. Further increasing the antibody dose did not further reduce the phagocytic capacity of PAM. This suggests that the phagocytic capacity of PAM is completely blocked when 1.5 μg/mL of the Sn-specific mAb is administered. Interestingly, the CD163-specific mAb 2A10 had no effect on phagocytosis, even at concentrations 30 times higher than the dose at which the Sn-specific mAb showed a maximum effect on phagocytosis. Similarly, experiments performed with a polyclonal antibody against CD163 also showed no effect on PAM phagocytosis (data not shown). In both cases, the effect of the CD163-specific antibodies was comparable to the effect of the isotype-matched control mAb treated or non-treated cells. Our data show that binding of the Sn-specific mAb to its receptor Sn leads to a similar inhibitory effect on PAM phagocytosis as observed after PAM inoculation with European genotype PRRSV, which suggests the involvement of Sn in the previously observed downregulation of phagocytosis by European genotype PRRSV. Our findings indicate that the observed downregulation of phagocytosis upon European genotype PRRSV inoculation is due to the interaction of the virus with its receptor Sn, but not CD163. Antibody binding to sialoadhesin, but not CD163, downregulates phagocytosis. Flow cytometric analysis of the effect of Sn- or CD163-specific antibodies on macrophage phagocytosis. The effect of the Sn-specific mAb 41D3 (Black circle), the CD163-specific mAb 2A10 (Dark grey circle) or an isotype-matched control mAb 13D12 (Light grey circle) on phagocytosis of beads by viable macrophages, expressed as the percentage of viable cells that have beads associated with them (A) or the MFI per viable cell (B), which is a measure for the amount of beads per cell. PAM were incubated with the indicated amount of mAb for 1 h, after which a phagocytosis assay was performed. As a control, non-treated PAM were included in the study. In addition, a phagocytosis assay was performed at 4°C (dotted line) with non-treated cells, to assess the percentage of macrophages that have beads bound to their surface and their MFI. Data represent the mean ± SEM of 3 independent experiments. *p < 0.05; **p < 0.01; ***p < 0.001. The present study shows that interaction of European genotype PRRSV with macrophages causes a clear reduction in macrophage phagocytic capacity, reducing both the number of macrophages phagocytosing beads and the number of beads taken up per cell. Using inactivated PRRSV (LV), we show that the observed downregulation of phagocytosis results from binding of PRRSV virions and their subsequent internalization, without the need for viral replication. This is supported by the fact that a higher number of internalized virions corresponds to a higher decrease in phagocytic capacity, both for Marc-145-grown and macrophage-grown virus. Finally, we suggest that the extracellular interaction of European genotype PRRSV with its receptor Sn, but not CD163, inhibits primary alveolar macrophage phagocytosis at the early stage of virus entry. The fact that phagocytosis is inhibited 1 h after virus inoculation further supports our reasoning that the reduced phagocytic capacity is not merely due to virus-induced macrophage death, as often stated, and that the interaction of the PRRSV virion with its target cell is sufficient to reduce PAM phagocytosis. From previous research it is know that PRRSV has a replication cycle of approximately 12 h, after which the virus is released from the cell, thereby killing its target cell . Moreover, it was shown that early in infection, PRRSV promotes anti-apoptotic pathways in PAM, up to 8 h post infection. Thus, at 1 h post infection, no virus-induced cell death occurs and therefore the decrease in phagocytosis cannot be explained by virus-induced cell-death. It is known that 1 h post infection, internalized virions can still be observed, whereas 5 h post infection, virions can no longer be detected , which indicates that all virions are uncoated. Starting from 6 h post infection, newly synthesized structural proteins can be detected . Consequently, this supports our finding that entry of the virus into the cell, but not production of progeny virus, causes the inhibition of phagocytosis. Our study shows that a 1 h incubation of PAM with an Sn-specific mAb results in a decreased phagocytic capacity of PAM, whereas incubation with a CD163-specific mAb or pAb has no effect. Both Sn and CD163 are present at the cell surface and therefore available for antibody-binding. In addition, it was previously shown that incubation of PAM with any of these antibodies blocks infection of PRRSV, indicating that they can prevent interaction of the virus with their respective receptors ([28, 30]; H. Van Gorp, unpublished data). Moreover, at the highest administered dose, still no effect on PAM phagocytic capacity of the CD163-specific antibodies was observed. This concentration was 33 times higher than the dose at which phagocytosis was completely blocked with the Sn-specific mAb. Therefore, we conclude that the interaction of European genotype PRRSV with its receptor Sn, but not CD163, inhibits primary alveolar macrophage phagocytosis. Recent studies investigating the functional role of porcine Sn (pSn) have demonstrated that pSn is an endocytic receptor that mediates endocytosis of PRRSV or antibodies upon binding [26, 31]. pSn was also shown to induce signalling  and reduce phagocytosis  in PAM upon antibody binding. Therefore, it was suggested that antibody binding to pSn activates certain molecular networks, which results in the downregulation of pathways involved in phagocytosis. This might also explain how the extracellular interaction of European genotype PRRSV with Sn downregulates phagocytosis. The results obtained in our study indicate that a certain number of virions need to interact with Sn before a certain ligand-receptor signalling threshold is reached and PAM get activated. In this scenario, the interaction of the virion with Sn serves as a trigger for further signalling, leading to a downregulation of PAM phagocytic capacity. Once this threshold is reached, administering higher moi, and therefore higher numbers of virions, results in a further downregulation of phagocytosis. Ligand-receptor signalling thresholds have been described for different viral ligand-receptor interactions, e.g. the interaction of human immunodeficiency virus (HIV) envelope glycoprotein (Env) with coreceptor CXCR4  and of viral RNA with TLR7 , which must be reached to trigger sufficient activation of a receptor and subsequent signalling. Moreover, our results show that the phagocytic capacity of PAM can be blocked completely when a sufficiently high antibody dose or number of European genotype PRRSV particles (an moi of 30 of Marc-145-grown PRRSV (LV) or an moi of 100 of macrophage-grown PRRSV (Lena)) is administered. This suggests that once Sn is triggered sufficiently through ligand binding, whether it is an antibody or European genotype PRRSV virions, phagocytosis is maximally inhibited. Both for human and mouse Sn it is suggested that alternative splicing of the Sn gene produces a transcript variant encoding an isoform that is soluble rather than membrane-bound . It can be argued that these variants have no significant role in the downregulation of phagocytosis, since these variants are either excreted or present intracellularly in a non-membrane bound form, whereas surface-expressed Sn is needed to internalize PRRSV , subsequently downregulating phagocytosis. Moreover, no porcine splice variants have been reported, and no soluble Sn variants have so far been observed in vivo. Interestingly, at an moi of 1, all macrophages have internalized several PRRSV virions, indicating that many non-infectious virions are present. This can be due to storage and thawing of the virus, but it can also be a direct result from the high mutation frequency reported for PRRSV [44, 45]. If these mutations occur at crucial sites in the genome, the progeny virus will still be able to enter its target cell, but will have lost its ability to replicate upon uncoating and genome release. This observation is of importance if the observed inhibition of phagocytosis upon European genotype PRRSV infection also occurs in vivo, since non-infectious progeny virus is also present in the lungs of pigs, and can contribute to the downregulation of PAM phagocytic capacity. Several other viruses have been shown to affect phagocytosis. Respiratory syncytial virus and secondary dengue virus infections have been shown to increase macrophage phagocytosis [46, 47]. On the other hand, HIV, pseudorabies virus and influenza virus [48–50] infections are known to suppress phagocytosis, and in all cases this suppression is linked to an increased incidence of secondary infections. The way in which these viruses downregulate phagocytosis differs for each virus. For HIV for instance, one of the mechanisms causing the decreased phagocytosis in neutrophils and monocytes/macrophages is through the interaction of the cell with certain viral proteins, such as gp 120, p24 and Nef. It is difficult to comment on the relative moi at which phagocytosis is affected in these studies versus the moi at which European genotype PRRSV downregulates PAM phagocytosis. This is either due to different definitions of moi used in each study, such as egg infectious dose (EID50) or plaque forming units (PFU), or because persistently infected cells or cells isolated from infected individuals or animals were used and no moi was determined. It could be argued that the observed downregulation of PAM phagocytosis in our study occurs at relatively high moi, however, it is difficult to assess which moi are reached in the lungs of pigs in vivo. For PRRSV (Lena), titers of up to 107.8 have been reported in BAL (bronchoalveolar lavage) fluids , corresponding to an moi of 63, and it can be argued that the effective titers in the lungs will be even higher, due to freeze/thawing and storage procedures. PRRSV is a major player in porcine respiratory disease complex (PRDC) (reviewed by [24, 51]). Field reports and clinical evidence demonstrate an increased incidence and severity of secondary infections associated with primary PRRSV infections. Strikingly, the direct effect of the virus on macrophage phagocytosis during the early stages of infection is poorly studied. Whereas some authors report that PRRSV infection has no effect on the uptake of Staphylococcus aureus and Escherichia coli, other authors report an impaired phagocytic capacity against Candida albicans, Salmonella typhimurium, and Haemophilus parasuis, which supports our findings. Importantly, all of these studies showed, like we did, that virus-induced cell death was not involved. One of the factors influencing the outcome of these experiments is the secondary pathogen, and specific isolate, used. Each pathogen interacts with PAM in a different way and each secondary infection might have an additional immunomodulatory effect on PAM. Therefore, in our study, polystyrene beads were used as a reproducible, inert model to study the effect of European genotype PRRSV on PAM phagocytosis. Additionally, different PRRSV isolates might influence the outcome of each experiment, which was not the case for the two isolates used in this study. Yet, preliminary results indicate possible divergent effects of North American genotype PRRSV isolates on PAM phagocytosis (data not shown), which we are investigating in an ongoing study. In a previous study, Van Gucht et al. showed that infection with PRRSV sensitizes the lungs for production of proinflammatory cytokines upon exposure to lipopolysaccharides (LPS) and demonstrated that overproduction of these cytokines led to respiratory disease. If the observed inhibition of phagocytosis upon European genotype PRRSV infection also occurs in vivo, higher amounts of LPS will be present in the lungs after infection, since removal of secondary or opportunistic bacteria, and thus bacterial endotoxins, from the alveolar space will be affected. This could lead to a further exacerbation of cytokine production and more severe respiratory disease. This might also explain why an uncomplicated PRRSV infection often fails to induce overt respiratory disease , although PRRSV is a primary agent in PRDC. To our knowledge, the present study is the first to show a direct effect of European genotype PRRSV on PAM phagocytic capacity in vitro, linking it to the interaction of the virus with its target cell, and more specific with its attachment and internalization receptor Sn. If similar events occur in vivo, this contributes to the reported increase and severity of secondary bacterial infections following European genotype PRRSV infection and the prevalence of European genotype PRRSV in porcine respiratory disease complex (PRDC). Peter L Delputte and Hans J Nauwynck contributed equally to this work. The authors would like to thank C. Vanmaercke, C. Boone and D. Helderweirt for excellent technical assistance and Dr W. Van Breedam for useful discussions and comments on the manuscript. M. De Baere was financially supported by the Flemish Institute for the Promotion of Innovation by Science and technology (I.W.T.-Flanders; SB 71434). H. Van Gorp was financially supported by a post-doctoral grant from the Special Research Fund of Ghent University. This research was further supported by the Industrial Research Fund (IOF) of Ghent University  and the (IWT – SBO 80046) . The study sponsors had no involvement in study design; in the collection, analysis and interpretation of data; in the writing of the report; and in the decision to submit the paper for publication. MDB, HVG, PLD and HJN designed the study. MDB performed research, analyzed and interpreted data and wrote the manuscript. HVG, PLD and HJN contributed to the editing of the manuscript. PLD and HJN contributed important intellectual output and the supervision for the study. All authors read and approved the final manuscript. Flemish Institute for the Promotion of Innovation by Science and Technology Website [www.iwt.be].